TV presenter and antiques specialist Paul Martin has kept himself busy following the announcement that Flog It!, the show he presented for 17 years, has been scrapped. Former Flog It! presenter Paul Martin launched 'Make Me A Dealer' on November 5 on BBC One. Image credit: BBC Osian Davies. He is now involved with two new daytime TV shows: Make Me a Dealer, which made its debut at 4.30pm on Monday November 5, and a game show called Curiosity which is currently advertising for contestants. Make Me a Dealer features two amateur enthusiasts competing against each other to buy at auction with their own money. With advice from Martin they then hope to sell on their wares and the winner is the contestant with the most profit. The show has voiceovers two narrators - one male and one female - who describe Martin as a “master of antiques” who will give the “would-be wheeler dealers” insider knowledge on how to be a successful dealer. Episode one began in Cirencester at an antiques centre where contestants Clare and Don took advice from Martin on what might sell for a profit. They were then handed auction catalogues from Bristol Auction Rooms to study ahead of the auction the next day. Martin’s tips in advance of the auction include “sit where the auctioneer can see you, don’t be at the back hiding away” and “be focused and relaxed”. The programme films the contestants bidding in the saleroom and is arguably more realistic than many television shows on the art and antiques trade as it depicts the actual cost of buying at auction – fees are included rather than just the hammer price. It also highlights that often many lots sell well in excess of their “guide prices” or estimates and demonstrates that a majority of bids often come via online platforms such as via thesaleroom.com whereas the contestants are bidding in person at the auction house. The two contestants, Clare and Don, bought items including a bakelite telephone for £43.40, a box of toy cars for £24.80, two cabinets for £43.40 and two pottery cats for £62 – all prices including fees. They were then filmed trying to sell their items on – including at an indoor market in Bolton and at local businesses on the high street in Northumberland. It was a close call - Don turned a profit of £159 – a 117% increase, while Clare was victorious with a £194 profit – up 121%. Will they become a dealer? The show will likely divide opinion among the established art and antiques trade. In its favour is its depiction of buying at auction - demystifying the process, thereby making it more accessible to average viewer, as well as clarifying the costs involved. Martin is his usual affable and enthusiastic self - appealing for the daytime audience. But some viewers may dislike the simplistic narration, the inevitably contrived filming of the moments when buyers review and purchase the dealers’ wares and the show's focus, at least in the first episode, on low-value collectables rather than antiques. Others may see it as pleasant daytime TV fare - a version of Put Your Money Where Your Mouth Is featuring amateurs, crossed with Bargain Hunt in reverse (buy it at auction and sell it somewhere else). It is probable that diehard fans of Flog It! might not see it as a suitable replacement for the show they loved. However, Martin hopes the show will encourage more people to start dealing. He told ATG: “I’ve been a dealer all my life so I know the pitfalls. In this show the contestants are investing their own money and we are buying at auction. This is the right way around compared to other shows so hopefully real-life dealers and the trade will appreciate that. “The trade may knock these shows but it isn’t daytime TV that is impacting the trade. It’s the internet that is diluting knowledge. Everyone can do their own research online. “Being a dealer is taking the knocks and the risks and this programme shows that. This series has already seen two of the contestants take space in antiques centres. The more dealers there are, the more stock will come on the market which is good for everyone. Martin's next show will begin filming in January with Hungry Gap Productions. Called Curiosity, he describes it as a cross between an antiques show and Crystal Maze. 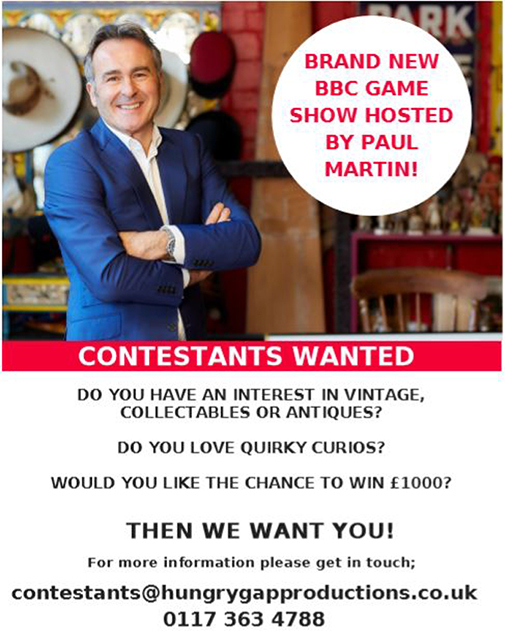 Presenter Paul Martin is launching a second new antiques series. He is also launching a book My World of Antiques: collect buy and sell everyday antiques like an expert on November 15.